corresponding total for any of the previous four years. in 1958, 1960, 1962, and 1963.
and distributed by truck to the schools. (Reported by Dr. Philip K. Condit and Dr. Rebecca L.
first harness track affected was in New York on April 12.
in States west of the Mississippi. this is a previously unknown strain of Type A virus. There is no evidence of widespread infection in man. vania (See MMIt R, Vol. 12, pages 167, 173). patients and employees; 28 remain under investigation. tion with the present outbreak. cases is shown in the accompanying graph. 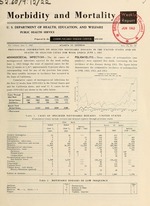 figures for February, 1962 regarding hotel "guest-nights,"
there was no apparent concentration in any one area. The means of contamination of the water is not clear. major defect was found in a principle water main. pared with an expected weekly average of 442. NOTE: All deaths by place o o ccurrece. in close contact with the smallpox cases admitted there. directly may have transmitted the disease to Case 14.
stands at 6, one-third of the secondary indigenous cases. site for spread both in the hospital and in the community. CLINIC HOURS: Monday-Friday, 10-11 a.m.